Note: The plaque states that the cable "was taken up in 1872." decreased to a point that often required the installation of a new cable. it could not be relaid in another location. This sign marks the entrance. 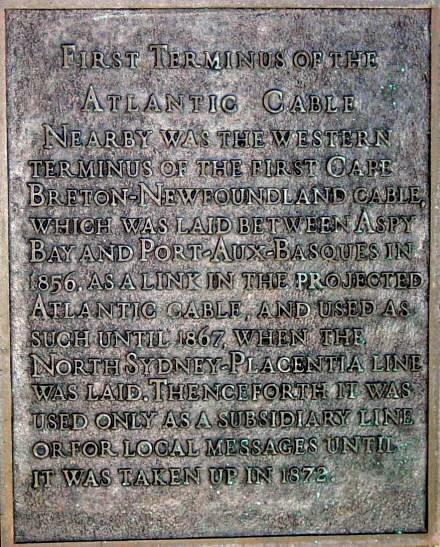 Cabot Strait telegraph cable was put into operation. IEEE (Eye-triple-E): the Institute of Electrical and Electronics Engineers, Inc. 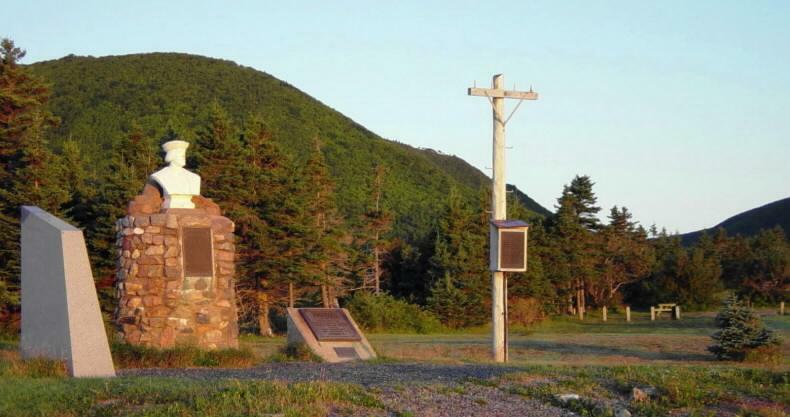 The St. John's to Cape Ray overland telegraph line followed the south coast of Newfoundland, allowing supplies to be delivered by ship to construction sites. The construction of this telegraph line employed 600 men, and was completed in the fall of 1856. The first message was sent on 1 October 1856 to Baddeck, Cape Breton from St. John's merchant J.S. Pitts. This message travelled along the overland telegraph line across Newfoundland from St. John's to Cape Ray, then across Cabot Strait through the underwater electric telegraph cable, then along the overland telegraph line across Cape Breton from Aspy Bay to Baddeck. One of the important challenges of the 1850s and 1860s was to get European news to New York as fast as possible. The New York newspapers were willing to pay enormous amounts of money for news from Europe if it could be delivered to them even a few hours ahead of the arrival of the mail steamship from England. 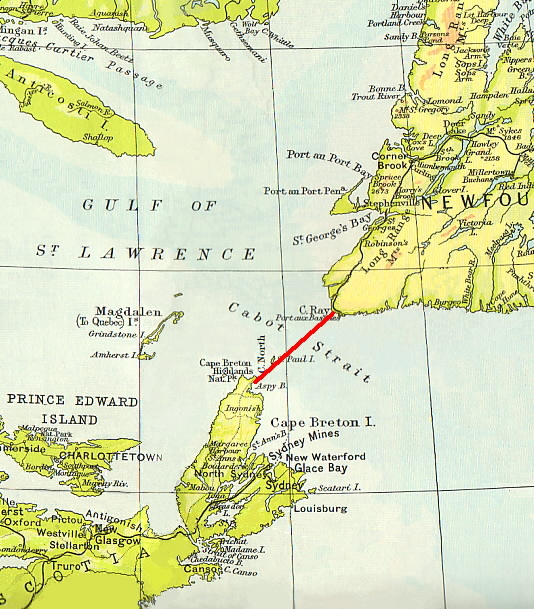 Frederick Gisborne saw the potential of St. John's as a transfer point for messages arriving by steamship from Europe to be telegraphed to the United States, but only (at least for the time being) in the sense that if a New York bound ship dropped off the news in Newfoundland, and it could then be telegraphed to New York, and the news would arrive at least 48 hours ahead of the ship. The newspapers would pay big money for that advantage. 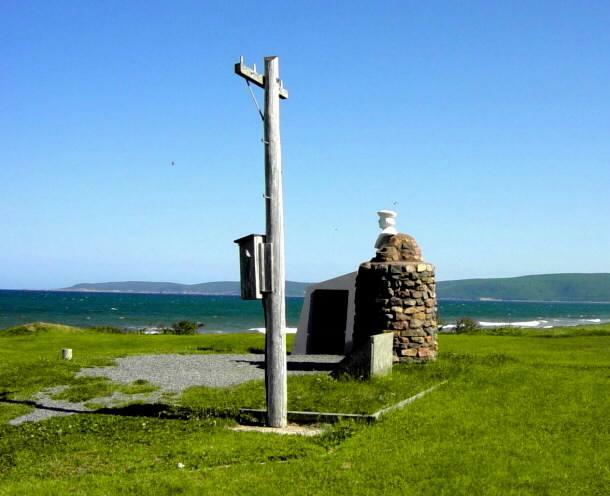 So Gisborne moved to Newfoundland, and began to promote a connection by electric telegraph along the south coast of Newfoundland and across Cabot Strait to Cape Breton. But St. John's was not a port of call for ships on their way to New York, and Gisbourne had a novel solution for that. 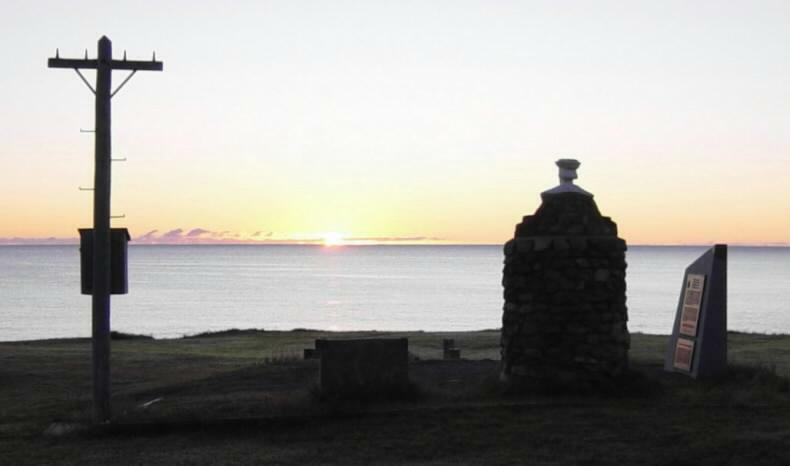 The big steamships passed near Cape Race, and he proposed that they toss a barrel containing the messages over the side, where it would be recovered by a waiting small boat and rushed ashore to Trepassey, where the news would be forwarded by telegraph. Believe it or not, this system eventually became operational, and New York newspapers carried numerous items of European news with the byline "Via Cape Race". In 1859 (after the failure of the 1858 transatlantic telegraph cable) the Associated Press of New York stationed a boat at Cape Race to intercept transatlantic steamships on their way to Halifax and New York. News and messages from Europe, thrown overboard from the steamers in water-tight canisters, were picked up and telegraphed to North American newspapers from the telegraph office at Cape Race. This practice continued up to the completion of the first successful transatlantic cable in 1866 and was acknowledged in North American newspapers by the byline "Via Cape Race". The receipts from the Newfoundland telegraph lines throughout this period of hope deferred (1858-1866) were very small and very precarious. In 1859 a news boat was placed at Cape Race by the Associated Press to intercept ocean steamers; the first ship met was the S.S. Vigo, of the Inman Line. The public constantly saw the heading in English and American papers, "Via Cape Race," but few had any idea of those daring trips of bold John Murphy to catch the outward and homeward bound steamers; considering the imminent peril of landing and launching boats from such a wild spot, it is marvellous how much news was sent in this extraordinary way. "The Anglo-Saxon off Cape Race"
When the S.S. (Steam Ship) Anglo-Saxon departed Europe it had the latest European news on board. As the ship passed Cape Race without stopping or even slowing down, a package (barrel) was tossed overboard to be retrieved by the A.P. news boat. While the transatlantic steamship Anglo-Saxon continued westward at top speed, the news barrel was picked up at sea and brought ashore by the news boat at Cape Race and immediately telegraphed to the Associated Press in New York – over the one-wire electric telegraph line owned and operated by the New York, Newfoundland and London Telegraph Company. This extraordinary effort got the latest European news to New York, and all North America, days ahead of the ship's arrival at its destination. The heading "Two Days Later From Europe" means this brief news item — brief because of the per word cost of telegrams from Newfoundland to New York — contained European news two days later (more up-to-date) than was previously available in North America. From 1859 to 1866, "Via Cape Race" in a newspaper headline was the equivalent of the "Breaking News" graphic we now see flashed on our television screens when important up-to-date news has arrived. Along the way, all of this news travelled through the Cabot Strait telegraph cable. Note: Part of this newspaper clip conveys the information that shipyards in England are building steamships and rams for the Confederacy. This refers to efforts by the Confederate Navy, during the American Civil War, to obtain warships from builders in Great Britain. "...The Confederate agent Bulloch extended his ambitions when he contracted with Birkenhead shipbuilders, Laird and Sons, to construct two turreted ironclad rams. Bulloch based the rams upon the ideas of Capt. Cowper Coles of the Royal Navy, an outspoken British ironclad designer. They were impressive ships displacing 1,423 tons (light) and were 224 feet long. Their iron hulls had ram bows supporting two turrets carrying 220-pounder Armstrong guns; lighter guns were mounted on raised forecastles and quarterdecks. Bark sailing rigs gave them range; powerful twin-screw engines combined with ram bows gave them ability to fight the most imposing Union ships... Bulloch was disappointed by the loss of the Laird rams..."
on its way to the United States. 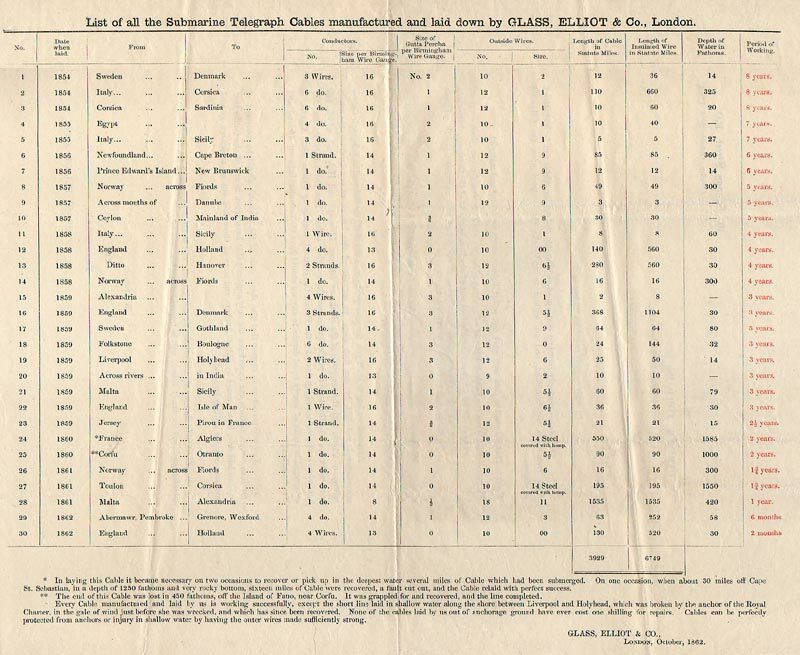 "By the steamer City of Washington we have received New York journals to the 18th ult. and a short telegram from Cape Race to the 22nd..."
Interpretation:— The steamship City of Washington departed New York on 18 October 1861. As was usual for all ships departing New York for any distant port, it was carrying the latest copies of New York newspapers ("journals"), brought on board at the last minute before the ship cast loose its lines and steamed away from the dock. This was the way the news was distributed in those days. Each ship carried copies of newspapers from its departure point, and when the ship arrived at its destination – in England or France or Brazil or Australia or wherever – those newspapers were hurriedly taken ashore and carried to the local newspapers for reprinting, and to the local electric telegraph office for transmission around the country, bringing to the local population the very latest news available from New York, and thus from the United States. If the ship took fifteen days to reach its destination, that meant that the latest United States news available there would be fifteen days old (a fact that today we have great difficulty comprehending). A steamship departing New York would normally take about ten days to arrive at Liverpool, England. When the ship arrived at Liverpool, the New York news would be taken ashore and quickly telegraphed throughout the United Kingdom and all Europe. This was the latest news available, but it was ten days old. 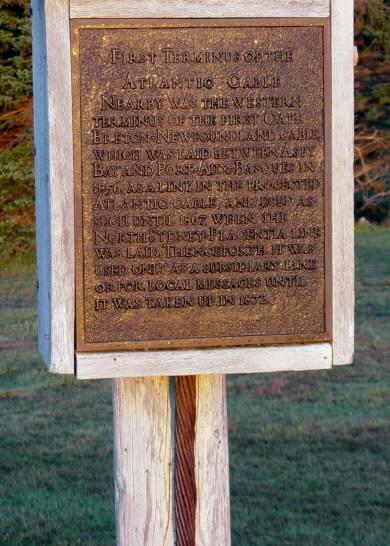 After the Cabot Strait telegraph cable was laid in 1856, there was a continuous electric telegraph line from New York to Cape Race. This means that messages could be sent in either direction between Cape Race and New York in a couple of hours. After the steamship City of Washington departed New York on 18 October 1861, on its way to England, it took about four days to arrive near Cape Race. As the City of Washington steamed past Cape Race, the latest news carried on the ship was then four days old, but, at the Cape Race telegraph office, the latest news from New York was only two or three hours old. 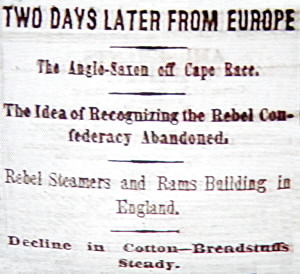 If the ship could get this up-to-date news from the Cape Race telegraph, it would arrive in England with news only six days old, instead of ten. Cape Race could cut four days from the age of the news as it arrived in England and all Europe. But the ship could not stop at Cape Race even for a few minutes to pick up this late news – there was no port or dock at Cape Race large enough for an ocean-going steamship, and anyway these transatlantic ships ran on tight schedules and would not take the time for even a brief stop in a port. Remember, there was no radio in 1861; there was no way to send a message from Cape Race to any passing ship other than to write that message on paper, put the paper in an envelope, and carry that envelope in a small boat from Cape Race out to sea, find the ship, go alongside the ship, and somehow transfer the envelope from the small boat to the steamship – on the open sea, a dangerous undertaking at the best of times. The demand for fresh news was so intense, that's exactly what they did. For seven years, from 1859 until 1866, scheduled passenger steamships passing Cape Race eastbound toward England would be handed a small package of the latest news telegraphed from New York. After the steamship City of Washington departed New York on 18 October 1861, on its way to England, it took about four days to arrive near Cape Race. As the City of Washington steamed past Cape Race on 22 October, the latest news from New York – only two or three hours old by the new electric telegraph – was carried out to sea and handed on board the City of Washington. This is what the London Illustrated News meant by "a short telegram from Cape Race to the 22nd." When they went to press on November 2nd, they had news from New York as recent as October 22nd – although it was only a "short telegram" (probably less than a thousand words) – there was at least a brief mention of any very important event that happened during those four days, from 18th and 22nd of October, after the City of Washington steamed away from New York. During the entire American Civil War, 1861 to 1865, all news that reached Europe about what was happening in the United States and the Confederacy, was carried across the Atlantic by steamship. When Abraham Lincoln was assassinated in April 1865, this news reached England and Europe more than a week later. 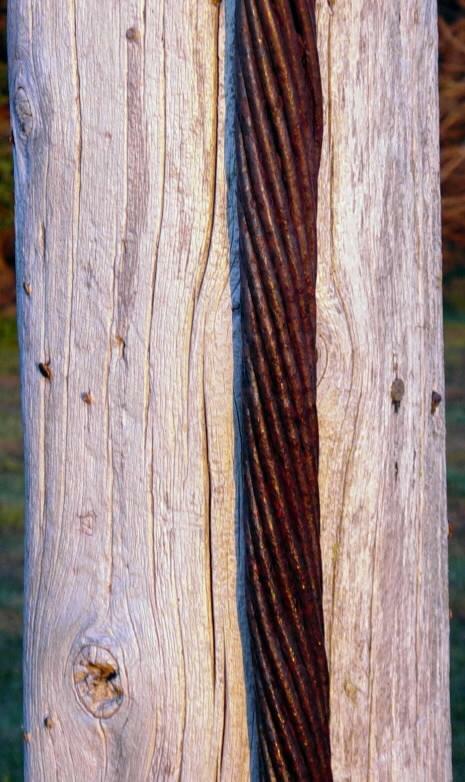 the Cabot Strait telegraph cable. "By the arrival of the steamer North American we have advices (news) to the evening of the 26th ult. (26 October 1861). The most important event of the week has been the completion of the great continental telegraph line, uniting San Francisco with New York, and so with Cape Race, Newfoundland – a connected line of 6000 miles (10,000 km], and the longest in the world. It was finished on the 25th ult. (25 October 1861)..."
"great continental telegraph line...the longest in the world"
The last telegraph cable was laid into Newfoundland in 1953. The Heart's Content office (then of Western Union) finally closed in 1965. Telephone cable traffic more and more replaced telegraph through the 1960s and 1970s, and that too is now gone. 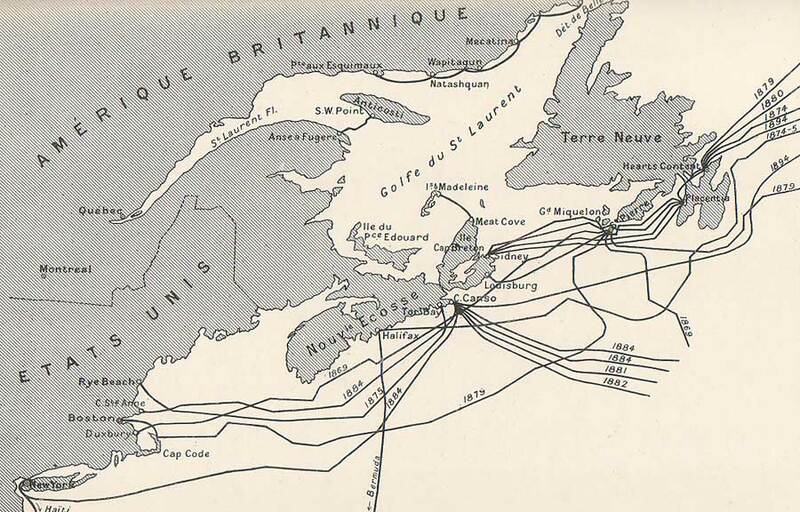 By the late 1990s the only underwater communications cables to operate to Newfoundland were two large fibre optic connections across the Cabot Strait. This list is organized chronologically, with the earliest cable at the top. 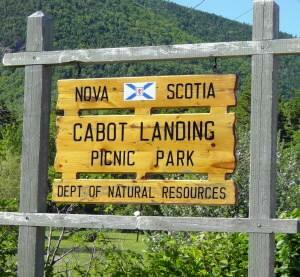 Number six on this list is the 1856 Cabot Strait cable, 85 miles 137 km long. telecommunications business in the 1890s (which continued into the 1950s). A good description of the earliest (1850-1857) underwater electric telegraph cables.